It is almost twenty years since Sir Brian Williamson, then running Gerrard & National, introduced Giles Rayner and his magnificent water sculptures to Charles Williams in order to enhance his Burncoose Nurseries stand, sponsored by Gerrard & National at the Royal Chelsea Flower Show. Every year since, Giles has been invited to provide a stunning new piece for the Burncoose stand, thus sharing in their plethora of gold medals. 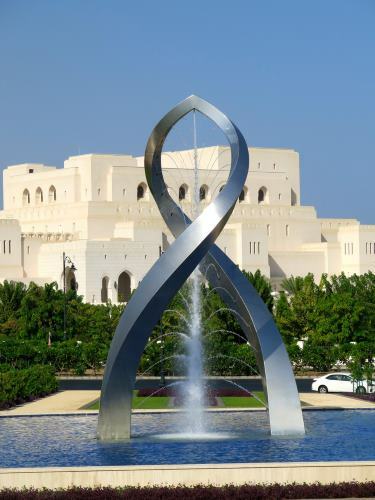 Such generosity has meant that Giles has seldom had to look any further than the flower show for most of his work with one major exception - his magnificent water sculpture Arches recently installed facing the Royal Opera House in Muscat, Oman. 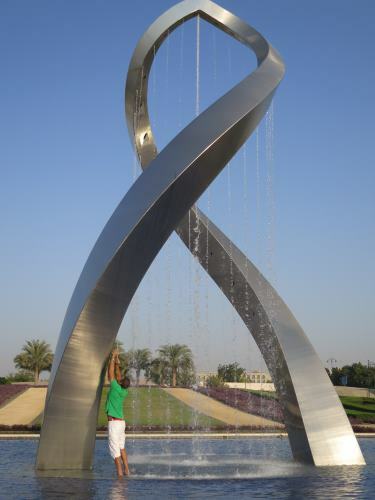 Commissioned by the Sultanate, the sculpture, which is made of Duplex, the toughest grade of stainless steel known to man, stands forty foot high. Arches photographed in front of the Royal Opera House in Muscat. Its twisting form is particularly intriguing, for while following the Ogive arches of the Royal Opera House behind, they change shape with every step taken in any direction. Equally spectacular are the water effects which simulate it’s stringed instruments, also dramatised by subtle lighting at night. One effect creates an S for Sultanate as the jets splash into the surrounding lagoon. The formal gardens were created as a special backdrop for Arches. 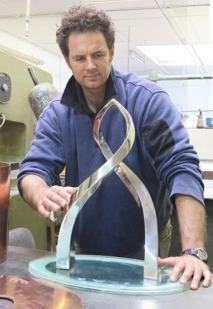 Giles, grateful to Burncoose for their continuing loyal support, now designs and installs water sculptures in many parts of the world, but his heart still lies at home in the magic of Great Britain’s country houses, parks and gardens. Working with our finest fabricators in stainless steel, copper and bronze, he carefully tunes each of his unique pieces, however large or small, to its own particular setting.